TERALBA Industries has expanded its range of pasteurisers based on its “Dimpleflo” tubular heat exchangers, to accommodate smaller batches of product and lower flow rates. 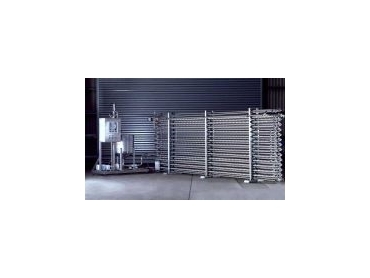 The Dimpleflo pasteuriser is typically a heat exchanger with three stage called “regeneration”, “heat”, and “cool”. Product, which can include juice, wine, syrup, toffee, yoghurt, eggs, is taken from cold storage at 4°C or ambient through regeneration to around 60°C - 65°C, being heated by 75°C - 80°C hot product returning from the heat section. The product at 60°C passes from regeneration to the heat section to be heated by steam or hot water to around 75°C - 80°C. This hot product is then cooled on the secondary side through regeneration by the incoming cold product, to which the heat is transferred. Product is then cooled to a nominated packaging or storage temperature in the final cool section using chilled water or glycol. Teralba can design and manufacture a multi-stage Dimpleflo tubular heat exchanger for integration into an existing-pasteurising system or to replace a plate heat exchanger which may foul with viscous or slurried products. Alternatively, Teralba supplies complete packaged pasteurisers including controls, pumps and valves.